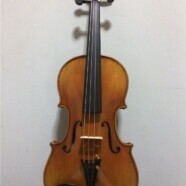 Reproduction of Antonio Stradivari Violins, made in China. Available in 2 sizes! Suitable for Concert & Master level violinists. You are getting value for money with this violin here. Beautiful handpicked flame spruce pieces and handcrafted with care. Please call 9733 9297 to arrange an appointment for viewing/collection of violins/accessories at our violin workshop in Punggol.